When I began to study human anatomy, I found the first clue to the solution of the problem in the distribution of body weight on the foot joints. I made this interesting discovery: the weight of our body, when we are standing, rests directly on the arch of the foot. A small area of ​​a few square inches on each foot carries all our weight. The weight of the standing body falls on the arch of the foot like a plumb line. 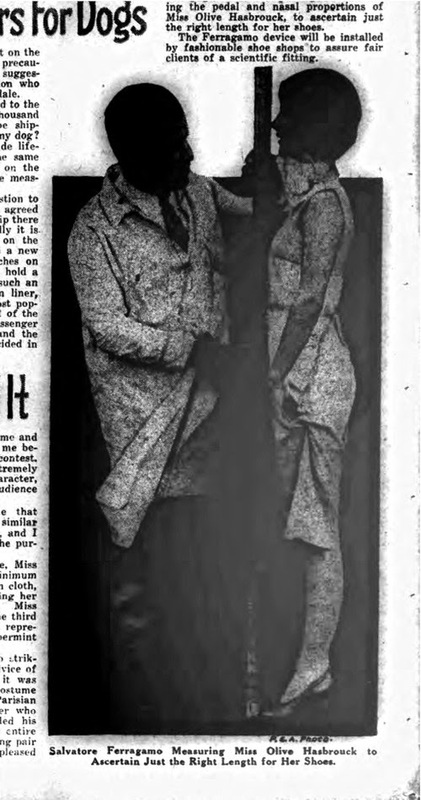 "After many months of research and experimentation, Salvatore Ferragamo, of Hollywood, expert on matters affecting the beauty of women, has come to the conclusion that a woman's feet, to be perfectly proportioned to the rest of her body must be just long enough to extend to an imaginary plumb line running to the tip of her nose. In other words, a plumb line suspended from the tip of a female nose should exactly hit the tips of the same person's feet. Or, as Ferragamo himself phrases it, "from the tip of her nose to the tips of her toes." Mr. Ferragamo studied the shoes and feet of several hundred women, and consulted numerous artists and sculptors, and his own aesthetic taste, before coming to the conclusion. He also devised a measuring scale whereby he could ascertain at a glance when a woman's feet are too long, or not long enough, according to his standard. It is a matter that is easily adjusted. The length of a woman's shoe may be lessened by making the heels higher, and increased by making them lower. If her toes extend further on a line than her nose, then she should wear higher heels. If they do not extend far enough, lower heels should be used. 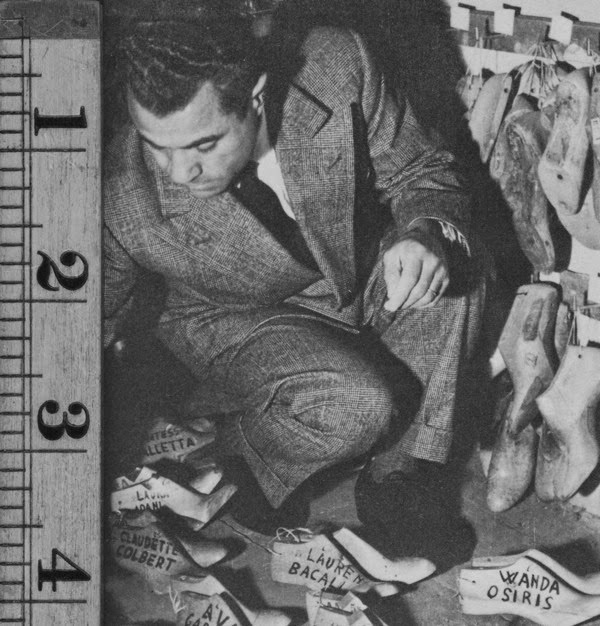 The photograph on this page shows Mr. Ferragamo measuring the pedal and nasal proportions of Miss Olive Hasbrouck, to ascertain just the right length for her shoes. The Ferragamo device will be installed by fashionable shoe shops to assure fair clients of a scientific fitting"
Digging archives is fun, isn't? It was a moment of marketing fluff set amid the trouble of the year 1927: Ferragamo was closing the Hollywood Boot Shop and setting up a large scale hand made production in Italy. No easy task. 90 years later, Ferragamo's homecoming is celebrated by the Ferragamo Museum with the exhibition "1927 The Return To Italy. Salvatore Ferragamo and Twentieth-Century Visual Culture"
Among other things, we can appreciate a different - and better shot - of the above picture even though the nose/toes theory has been amended as "Ferragamo measures the midline of a customer's body and feet". No explanation necessary, right? Right. "Ferragamo chose to settle in Florence in virtue of its acknowledged centrality in the geography of Italian taste and style at a time in which the word "return" was especially meaningful: the return to order in the arts, the return to professional skill and to the great national tradition." So we are told in the exhibition's intro, however it should be noted that Ferragamo chose Florence because there was no other place to go as stated by Ferragamo himself in his autobiography. He went up and down Italy only to experience closed doors as soon as he explained his idea for a hand-made footwear mass production made by artisans. Even his Naples rebuked him and in the end - exhausted - he just stopped in Florence. In other words: Florence wasn't first choice, but rather the last chance. The Nose/Toes theory was slightly adjusted twenty years later.